First up on our list of Shows To See This Week is a fiery addition to this weekend’s calendar at 94th Aero Squadron, the legendary military-themed classic American restaurant and home to the Rick Brunetto Big Band every Thursday night since 1989. 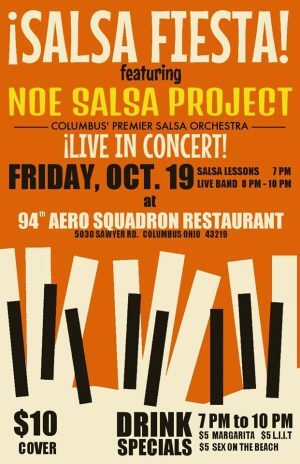 On Friday, October 19th at 7pm, the restaurant will host Salsa Fiesta featuring the Noe Salsa Project. The night will start with salsa dance lessons, the band will begin playing at 8pm, and a DJ will follow. Cover is $10. Noe Salsa Project “performs a variety of different music genres; including salsa, rumba, merengue, and jazz. Featuring songs in English and Spanish, the band performs cover music, original songs, and even puts a salsa twist on some classic rock songs.” Head to the Aero Squadron Friday for Columbus’ own top-notch salsa orchestra! Keep reading for more live previews. Sunday, October 21st (NEW TIME: 11am – 1pm): Doug Neel with Zakk Jones at Market District Kitchen & Bar, Bexley. Guitarist Neel has been holding down the brunch slot at this tasty restaurant inside the Bexley Giant Eagle Market District since the spring, usually performing as a solo guitar act. However, Neel recently announced that he will be playing duo for many of these brunch gigs for the rest of 2018 with a host of excellent regional guitar players. The two guitar action gets started this week with Zakk Jones, which is a pairing I’m sure will go well with chicken and waffles! The rest of the announced schedule includes appearances by Stan Smith, Colin Lazarski, Brett Burleson, Tom Carroll, Josh Hill, and Tom Davis, so visit our calendar for dates and stop by on a Sunday for great guitar jazz and excellent food and drink! Thursday, October 25th (8 – 11pm): Sounds of the City Music Series: An Intimate Experience with Chris Godber & Rhythmic Fusion at The Idle-A-While Supper Club, East Side. The expanded music schedule at this entertainment hot spot boasts a handful of truly intimate concerts with touring smooth jazz artists this month, which will be rounded out by this saxophonist’s long-awaited return to Columbus. Godber’s latest single “Vibin'” is currently riding high on the Billboard Smooth Jazz chart, and he recently released a gospel EP. Idle-A-While house band Rhythmic Fusion, led by virtuoso keyboardist Antuan Walker, will accompany Godber for a very soulful night! Tickets and full details are available here.